In the fall of 1943 the airraids on the city of Berlin intensified, and many more children were evacuated to the countryside east of the city. Some children from the district of Berlin-Spandau were sent to the small town of Vietz near Landsberg on the river Warthe. Today it is in Poland and is called Witniza por Gorzo. My mother, my 8 year old niece Marianne and I left Berlin at the end of September by train. My mother took a housekeeping room in town, while I and another girl from Spandau were placed on a small farm to help with the chores. The farmer was on the Russian front and the son was fighting in Italy, where he was killed at Casino. We helped with the chores in the early morning and in the evening. During the day we attended school in town. When we arrived at Vietz, everything in this little town seemed normal and almost peaceful. We enjoyed working on the farm, so different for us, coming from the big city. We learned a lot and for a few months it was very pleasant. I will always remember this time with fondness all of my life. My father had been exempted from military service because of a heart condition and also because he worked at the large plant in Berlin at Siemens, where his work was considered vital to the war effort. Most weekends he came to visit by train, and we went home on holidays and school vacations. My half sister Luzie also worked at a factory in Berlin, while her husband was on the front in Russia. It was their daughter who was with my mother in Vietz. Time passed quickly and soon events started to happen fast. The front lines were coming ever closer towards us. In late 1944 we saw countless refugees heading west, mostly on horse-drawn wagons which held their belongings; some had livestock tied to the back of their wagons. After Christmas 1944 this exodus intensified. At times we could hardly cross the street on our way back to the farm. Thousands of people had taken to the road, fleeing west from the advancing Russian troops. In January 1945 my mother became worried when she saw columns after columns of German soldiers retreating in the westerly direction. There was no official word from school authorities for the children of Berlin to return to their homes. Still, we were waiting to hear something. We heard nothing at all, and finally on January 30 my mother decided that it is time for us to try to get home on our own. To our disbelief we found the railroad station closed. Apparently the service had been suspended. Trying not to panic, we went back to the main street and watched the trucks filled with soldiers passing by. It seemed endless. At first we were unsuccessful to get a ride with the army. Suddenly, everything came to a halt because of the many refugees blocking the road. It was then that I told a soldier on the back of a truck that we had to get back home to Berlin. To my relief he motioned for us to get on the truck. So began our slow moving journey west. Just before we reached Küstrin on the river Oder, low flying Russian planes appeared from nowhere. They made a big turn and headed back east. We were terrified, but the soldiers seemed to pay no attention to them. In all fairness I must say that the soldiers treated us very decently, some even shared their rations with us. When we reached Berlin-Erkner in late evening, they let us off at the S-Bahn station, where we took the city transit to Spandau. It seemed to me that the soldiers did not know their destination. They kept on proceeding west. I must point out that we were very lucky to get to Berlin, I heard from one soldier that they were told not to bother with civilians. It was good to be home again. So many people I saw on the road had no place to go . I do not know how the other children got back to the city. Earlier I had applied for admission to the teachers college in Landsberg, not too far from Vietz. An emergency program was in place for boys and girls age 14 and older to attend teachers college for four years, to alleviate the shortness of teachers drafted into the armed services. As Landsberg was no longer an issue, I enrolled at the Lehrerinnenbildungsanstalt, a teachers college for girls in Berlin-Charlottenburg, Knesebeck Str. 24. My first day there was on February 20, 1945. Every day I took the S-Bahn from Spandau to Charlottenburg. Thinking back now, it amazes me how we pretended that all was well, knowing all the while that the Russians were assembling for the last assault on the city at the river Oder, about 100 km or so to the east of us. Everybody went about their business as if nothing unusual was happening. The airraids were still going on, by day the RAF bombed the city, and during the night the Americans were unloading their deadly cargo over Berlin. We all seemed to be in some kind of a daze, when the sirens wailed their warning, we went to the shelter and waited for the all-clear. Then we kept on going. During a day time raid on Spandau my mother’s aunt Frieda and her husband Robert Lange were killed. It was a direct hit on Feldstrasse 41 and no one got out alive. At that time I began to worry about my mother. She was inconsolable. My half sister Irma was somewhere in a camp in Poland, because she had circulated a joke about Hitler at the Radio station where she had worked in the cafeteria. My half sister Luzie and her daughter were now living with us in Spandau, as they had been bombed out in Berlin-Schöneberg. Luzie and I managed to calm our mother and we succeeded to keep it together. I kept on going to school in Charlottenburg. I remember one day sitting in the S-Bahn on my way to school, I looked around me and saw anxious eyes searching the skies. Nobody said anything, but I sensed we were all looking for the same thing: American paratroopers. No one really believed that the Western Allies would let Berlin fall to the Russians. When we realized that Eisenhower had stopped on the river Elbe to the west of us, many people started to leave Berlin. We listened to the daily tirades of our propaganda minister Goebbels on the radio, telling us what we could expect when the red hoards should reach the city. A couple of times I heard him tell the Berliners to fight with anything we could find. But I honestly must say that we did not pay attention to such ravings. There was a time when I pleaded with my mother to leave for the west, although we did not know anyone there. She just said that we would stay here, come what may. In the middle of April 1945 the sky in the east was red in the evening and we could hear the rumblings of the guns. Still, we lived our lives as normal as possible. I believe that the Russians started the artillery bombardment of the eastern parts of the city on April 19. I remember the next day very clearly. I was still in school in Charlottenburg and our English teacher Frau Dr. Annemarie Freund mentioned the birthday of the Führer in the first class that morning. Shortly afterwards the sirens wailed and everybody scrambled into the school shelter. The airraid seemed to last a long time and bombs hit close by a couple of times. I remember the screaming of the girls, then suddenly everything was eerily quiet. The all-clear brought us back into the class room. But nobody seemed to pay much attention to the teacher, we were all listening to these strange new noises of the artillery bombardment, which sounded, at times, way off in the distance. That morning airraid was the last one on the capital. The Western Allies now left it up to their comrades in the East to deliver the death blow to the city. Around noon the principal appeared at our class room door, telling us to return to our homes "until further notice." It now was official: The Last Battle had begun. I made my way to the S-Bahn station with another girl from Spandau. We found a large iron gate blocking the stairs leading to the platforms. Apparently the service to Spandau had been suspended during the morning. As usual, the public was not informed. The shelling was still sporadic, but we saw people running in all directions. We decided not to waste any time looking for transportation and started walking towards Spandau. We ducked into doorways of still standing buildings whenever we heard the shelling coming close. We saw disabled street cars everywhere, their electric wires dangling to the ground. ( The result of the last airraid.) Whenever an artillery shell hit, we could see debris and dirt flying through the air and falling back down to the street. It took us over three hours to reach Spandau. My mother was again in a fragile state of mind, having been worried about my safety. My father had come home earlier that day from Siemens, as the huge plant had also closed its doors. He was now on the way to his brothers bakery in the old part of Spandau. He took a shortcut over the pedestrian walk of the railroad bridge close to the city hall. On his way back, just after having crossed the bridge, he was thrown to the ground from an explosion behind him. The bridge had been wired by the defenders and then blown up, again without any warning, not even a sign on the bridge to alert civilians. My father made it home quite shaken, but thankfully unhurt, and he brought with him enough bread to get us through the days to come. Shortly after he arrived, my mother suffered a severe gall bladder attack. While she was lying in bed, Luzie and I started to get a few things together to take with us to the shelter. The airraid warden was pounding on our door, shouting for us to head for safety. There were no more warnings by sirens. 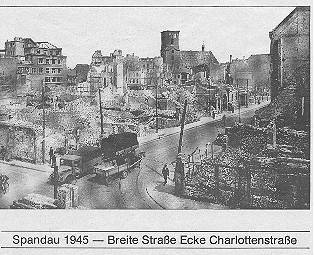 By now the shelling was reaching Spandau. By early evening my mother had recovered enough for us to leave for the shelter. The cellar in our own house was considered unsuitable. We had always, during the airraids, gone to a public shelter around the corner. It was one of many for people caught in transit during a raid. A few hundred meters away from us stood a cement bunker beside the Charlotten bridge. It had been reserved for mothers and children all through the war years. Abiding still by this rule, and not wanting to be separated from my father, the five of us set out for the public shelter. Inside, I counted 32 people, mostly women, children and older men. I realized that I was the oldest of the children, and I tried to occupy the younger ones with games and songs. At first people were still going outside for a few minutes, just for some fresh air, although no one could call it that. A curtain of smoke hung low over our part of the city. The days turned into nights, and time seemed to have no meaning. The noise of the battle became louder each passing hour. At one point we heard some pounding on the steel door. The airraid warden unlatched the door reluctantly, and to our surprise we saw several neighbors from our street. We heard that half of our street had been demolished, our house as well. My mother was so distraught she wanted to run out and drown herself in the river. Again we had to calm her down, and I remember going around the cellar telling people "We are alive and the war will be over soon, nothing else matters." Around that time we heard some strange vibrating noises coming from the street. "Tanks", the older fellows said. Tanks? Whose? Frau Gotsch, who had come in with the latecomers, whispered to me "Ursel, draussen ist die Hoelle auf Erden." ( It is hell on earth out there. ) A couple of times the cellar shook from a nearby rocket launcher, which we called ‘Stalin organs’. The situation was fast becoming intolerable in the shelter, the smell was awful. I slept through airraids and artillery bombardment, but now the thoughts of things to come kept me wide awake. Then came the time when the airraid warden motioned to me that he wanted to speak with me. He spoke in a low voice, telling me that above us were three stories of hot ashes and debris, and that he did not know if the ceiling would hold. He did not want a panic on his hands, so I went around again, telling everybody to put on their helmets and gasmasks ( which had been issued a few weeks earlier ) and that we would have to try to get to the bunker at the bridge, somehow, because of the ruined building above us. It seemed like forever, but finally I saw some people arriving who had been with us in the public shelter, along with my mother and Luzie with her daughter. When my father arrived shortly after, we all went into the bunker. I found out then that the Russian soldier had called some of his comrades to help the civilians across by getting them to hold his belt in the back. And so, in single file they all were led to the safety of the bunker. The shooting was still going on when we went down inside the large cement structure. Before I go on with my story, I would like to make a comment here: We were extremely lucky that the Mongolian regiment was fighting in our street. They were affiliated with the Red Army, and it is my guess that they did not feel as much hatred towards us. Not for one minute do I believe that the Russians were told to save the German civilians. And this gallant soldier did save us, because we all agreed that we would have never found our way to the bunker in this unbelievable confusion. Thousands of civilians died during the last battle, and some of us would certainly have been among these statistics, if it had not been for this soldier who had taken it upon himself to lend a hand to us, the enemy still. For all these years it has been my deepest regret, that I was never able to thank this soldier. This cement structure had a capacity of about 250 to 300. It was jammed with people, as it was the only surviving structure in our immediate perimeter. We made our way to the back, in almost pitch darkness, stepping over dozens of injured people lying along both sides of the hallways. The Red Cross Nurse assigned to the bunker waved us through towards the very back where we ended up in a cubicle with two bunk beds full of people. In the corner I saw a cabinet with legs which held a short wave radio. I crawled underneath it while the nurse was shining her flash light for me to see. My parents found two folding chairs and placed themselves directly in front of me. My mother said that Luzie and Marianne are in the next cubicle, and knowing that everybody was accounted for, I closed my eyes and fell into a deep sleep of utter exhaustion. I do not know how long I slept, but I awoke when I heard Russian voices looking for German soldiers and Volkssturm (Home Defence). I also heard them asking for "Uhri, Uhri" and everybody handed over their watches. I was worried about my father who sat almost in the middle of this little room for all to see. Although the Russians took several men in civilian clothes away, thankfully, they left my father alone. As soon as the flash lights disappeared, we were once again in utter darkness. I suddenly felt something wet on my left arm. When the nurse came around again, I asked her to shine the light on it. We saw that it was blood. I know that I had not been hurt, and we immediately found the source. It came from the bunk bed above us on which Herr Gassel, our grocer, was lying. His right arm and hand was bleeding profusely. He had been hit by shrapnel trying to reach the bunker after his house was destroyed. The nurse rolled out a canvas stretcher and a couple of people carried him to the first aid station at the front. I never saw him again. We were constantly told by the nurse not to talk unless absolutely necessary, because the oxygen intake was limited. The toilets were overflowing; there was no water to flush. People were moaning, children were crying. It was utter chaos. I have no idea how long we had been in the bunker, when suddenly all Russian soldiers withdrew.. In my little hiding place I could hear people speculating what this could mean. The sounds of the guns became louder again, although still muffled through the thick cement walls. All of a sudden the whole bunker shook and I could hear women crying. I heard someone screaming "Sie jagen den Bunker in die Luft." ( They are going to blow up the bunker. ) I was too numb to care. I just closed my eyes. Voices were filtering through to us, and I heard someone say that the bunker had received a hit on one corner, but there was no structural damage. Some time had gone by since the Russians left, when I heard someone scream:" No, no, not you again." And there they were: German soldiers who had apparently "thrown the Russians across the river to the center of Spandau". I almost felt sorry for the reception they got, they must have been exhausted too, but it was understandable for the people to react as they did. We all thought the end of the war had come, and here we were again. My mother, a trained nurse, in full control now, took charge. She told my father to tell Luzie to get ready, and that we should try to get out of this stinking indoor disaster area, now, while the German soldiers were around. I just asked meekly "Where will we go?" The answer came: to my uncles bakery. I was still too dazed to object and I understood her reasoning about the awful sanitary conditions in the bunker. So, all five of us made our way to the front in the same way as we had come in. I could hear one of the soldiers telling the people that a regiment from Potsdam was trying to reach us and they should be here shortly. I would be handling the truth carelessly if I said I cared who was trying to reach us. Holding firmly on to the hand of my niece, we both ran across the wide street littered with bodies. Looking to my left, I saw a large group of German soldiers coming towards us, on trucks, on horses and on foot. . Luzie and our mother came right behind us. My father was already waiting in the ruin directly across from the bunker. All of us cowered down and tried to make sense of what we were seeing. Hundreds and hundreds of soldiers went over the Charlotten bridge, which was now to the left of us. We saw civilians among this vast exodus, and once in a while shells were exploding right in the middle of it all. We listened to some voices and my father said that someone was next to us in the ruin to the back. 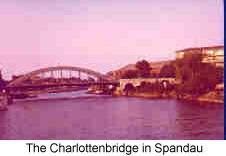 A couple of soldiers had rested there and they told us, that the Charlotten bridge was the only way out of the city, and that General Wenck was trying to get as many soldiers to the west as he could. It must have been a couple of hours that we sat there and watched this never ending exodus, before we mustered enough courage to cross the bridge. My father had watched the bridge very carefully, and he told us to get really low when we reach a certain point. He saw people disappearing and thought that perhaps snipers were aiming at the bridge from the tower of the city hall. We decided not to join the parade on the street leading up the bridge, but to take a short cut over the wide steps leading up from the side. The bodies were lying so thick one over the other, German soldiers, Russians, and civilians, that I could not see the steps. I reached the bridge first, completely numb. We kept close together and started on the pedestrian walk on the left side of the bridge, while in the middle the exodus continued. With my mother directly behind me, I started to crouch down, when suddenly a woman in front of me stopped and let out a terrible scream as the stroller with her baby disappeared through a gaping hole into the river below. I grabbed the woman, and was trying to push her around the hole, when I saw an SS officer to my right pointing a pistol at us, shouting "Weitergehen!" At that point I was at the verge of a nervous collapse. Having just witnessed this tragedy and one of our own soldiers threatening to shoot if we held anybody up, was almost more than I could bear at that moment. My mother and I got the woman around the hole and she ran off ahead of us. I was crying so hard I could hardly see. We reached the other side of the bridge and turned left into the first ruin, waiting for my father and Luzie and her daughter. Thankfully, just minutes later all three ran past us. My mother ran behind them and all came back to where I was sitting . I had seen so much death and destruction, but somehow that bridge fiasco just about pushed me over the edge. It did not help when my mother said "I don't think he saw the baby". It made no difference to me, all I could think of was that a Russian soldier had helped me, and a German soldier had pointed a gun at me. I can assure every reader, that I saw in his eyes that he meant what he implied. Over 50 years have passed, and I can still see the look in the eyes of that officer who wore the uniform of the SS. Perhaps I was lucky that this fleeting encounter on the bridge was the only contact I ever had with a man of that kind. I think what devastated me most besides the death of that little innocent baby, was the total disregard of the military towards civilians. As long as they could reach the Americans in the West, to hell with the Berliners. I knew we had to keep going, so I pulled myself together. We walked through the school yard on the Mauer Strasse and ran into the park behind the city hall, called Stabholzgarten, which is now a large parking lot. We looked up at the Rathaus and saw flames shooting high out of the city hall tower. We could still hear shooting and we ran from tree to tree until we reached the underpass of the S-Bahn. We kept close to the cement wall, and then we saw it: The whole block where my uncle's bakery was located on Brunsbuetteler Damm had a white flag in almost every window. We ran across the wide street, one after the other, and a few minutes later we were at the bakery. My uncle lived 6 km away in Staaken. So, we all went down to the cellar in the apartment house. The Russians had not been there yet, and when we told some German soldiers who were resting in the cellar, that we had already encountered the Russians, they had many questions. When they heard that we had come across the Charlotten bridge, one soldier said "You came over "die Todesbruecke? !”” ( death bridge ). My father had gone upstairs and found Nicholas, a foreign worker from the Ukraine, who lived with his wife and daughter at the bakery. I had taken the little girl Svetlana to the Zoo on one of my school vacations, and when Nicholas saw us, he told us he would hide us with his wife and daughter in the private cellar through a trap door under the bakery. He would stay upstairs, as he could communicate with the Russians once they got there. Luzie had ran past the bakery with Marianne, as she did not know exactly where it was. So, my mother, my father and I crawled down into this cellar. Of course, my mother started to worry about Luzie. But we were all so tired that soon we fell asleep on the cots. Another night passed. Nicholas brought us some food and he even made us some "coffee" from chicory or something. The next day we heard my uncle’s voice upstairs. Apparently, by now the hostilities had come to an end, and he came to check out the bakery. He was glad to see we were all right, but he had tears in his eyes when he heard that we had lost everything. As far as I understood it, the surrender had not been officially signed, so we had to wear white arm bands on the street. Nicholas ripped up a pillow case and we all tied pieces around our arms. Then we struck out for Staaken. It is hard to describe the devastation we saw. Dozens of German soldiers were lying in the streets, -- but I saw some civilians starting to load the dead on wagons for burial. My mother remarked that perhaps these dead soldiers were the ones we saw crossing the bridge. At the corner of Magistratsweg we saw a Russian woman officer handing out surgical masks to everyone who passed by, as the stench was overwhelming. When we reached the plant of Orenstein and Koppel, a lot of people who had taken shelter there came out to the street. I heard Luzie calling my mother, and we all proceeded together in the direction of Staaken. My uncle’s house was full of survivors from Spandau, all people he knew. So, he put us up in the kitchen behind the bakery store on Heidebergplan in Staaken. It had a toilet, and my aunt brought blankets and pillows. I asked my uncle what day it was. It was Wednesday, May 2. Die Götterdämmerung is an opera by Richard Wagner ( I have always loved opera, but I never cared for Wagner's). This particular opera tells the story of Valhalla and the Gods facing their flaming doom and the end of the world. It was the end of our world as we had known it. But by the grace of God we came through it. We had lost everything, but we were alive. The guns were silent and at long last peace had come, as if the poet addressed these words to us "Here today begins a new epoch in world history, and you can say that you have witnessed it." If you enjoyed this story, Visit for more.